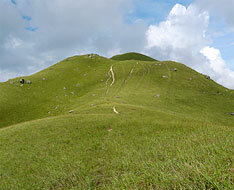 Kai Kung Leng at 585m high with a broad form of hill is towering in northwest of NT, north of Kam Tin. 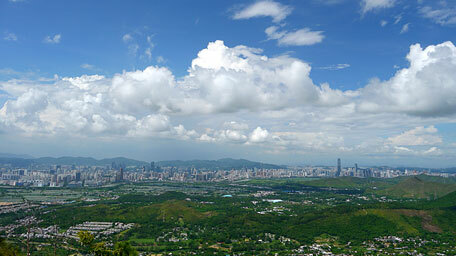 At the top, Kam Tin, Mei Po and Shenzhen could be seen. 1.There is no more shade trees along the way, sufficient water should be well prepared. 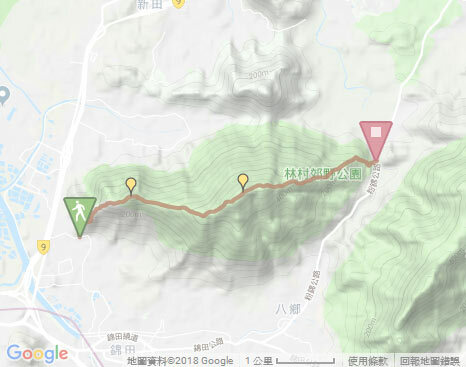 2.There are some branches with no signpost, recommand to carry map. After getting off at the outdoor basketball court beside Fung Kat Heung Road, go ahead to keep to the left along the road. 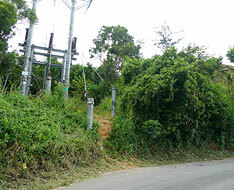 Not far ahead, take the side path by the electric pole on the left. It is gently up by starting a flight of wood steps. 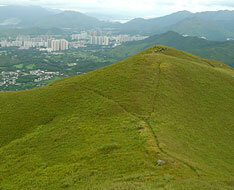 Along the ridge, the broad flatland of Kam Tin could gradually be seen in the distance after climbing up the several hillsides. 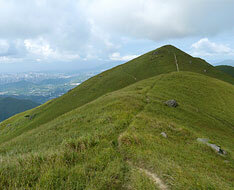 Up to a knoll, as a natural lookout pavilion, it offers the full views over Kim Tin, Yuen Long and Nam Sang Wai where has some deserted fishponds. Due to being westward, it is also a favorite location of photographers for shooting the sunset. 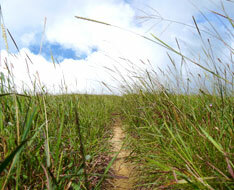 Continue on heading the trail along the ridge. 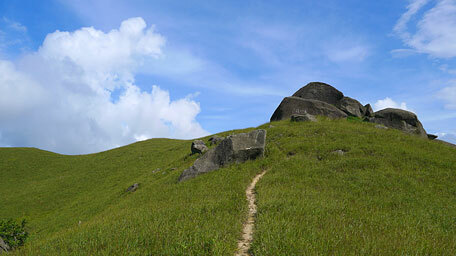 On the way, you could see some large peculiar rocks. 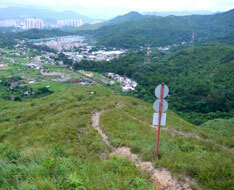 Through the transmission station and further up, it climbs to the top of Kai Kung Shan, the secondary hill of Kai Kung Leng. 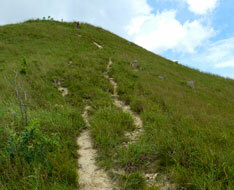 Continuing on along the trail, it contours along the ridge toward east. 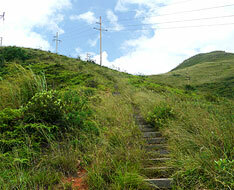 Part of the sections are quite steep but not too strenuous. 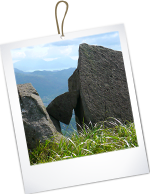 Overlooking toward its summit, it is admirable for the grandeur of the broad form of the hill range and the undulated sprawling ridge. 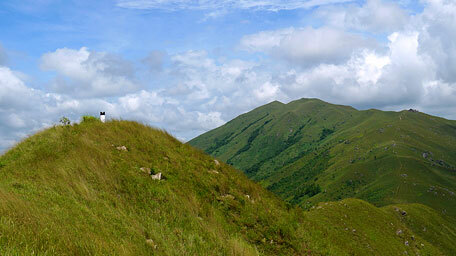 Looking back down, the ridge seems to be the back of a hude dinosaur stretching out to the ground. 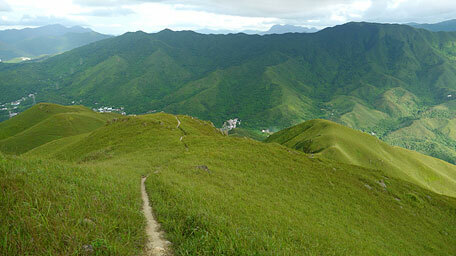 Moreover, the small green rounded hills are like the sea wave surging up. 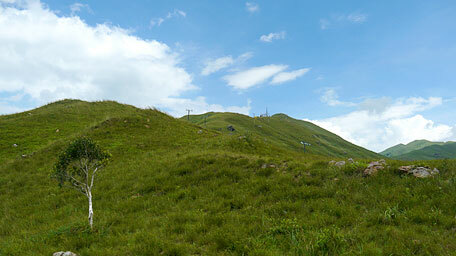 After climbing up several hillsides, it comes to the crest of the hill where there is a range pole. But the highest point is at the hill ahead. Further along the trail down and then up, it leads to the hilltop. 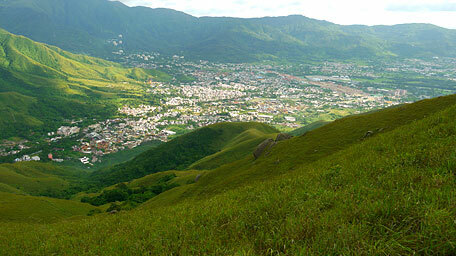 Looking around there, it offers the splendid full view. 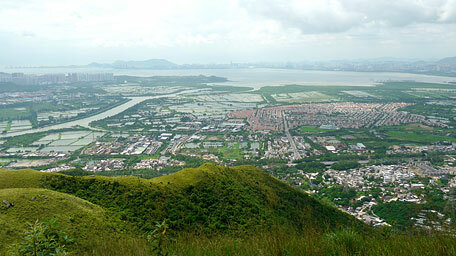 Overlooking northward, Shenzhen of China from the western Shekou to the eastern Sha Tau Kok is within the sight. 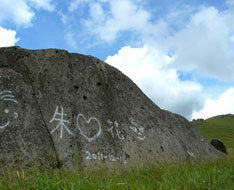 Gazing to the southeast, the mountain of Tai To Yan is horizontally lying as a large wide screen. 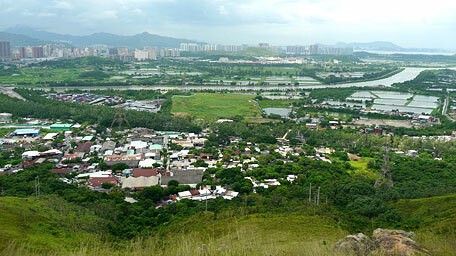 Toward the southwest, Pak Heung and Kam Tin could be seen in the distance. Head the trail downhill, it is obscure in part. 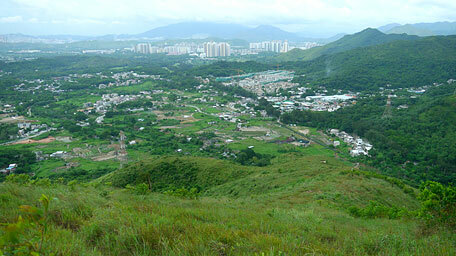 Along the way, you could overlook Sheung Shui and Fanling. Going down to the obvious junction, take the right fork that leads up to a knoll than goes down along the ridge. 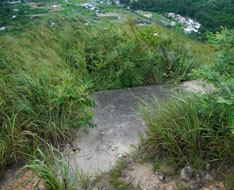 Descending to a small concrete platform which is an abandoned military installation (be carefull to look for it), and then further going down a short distance, it comes to the second concrete platform. There is a side path on the right when approaching the second platform. The entry of the path would be obscure due to overgrown weeds. Follow it down. 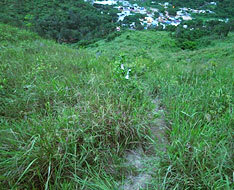 After joining the concrete path, take a flight of steps down to the village. Heading the path across a bridge and through under a large pipe, it arrives at Fan Kam Road. 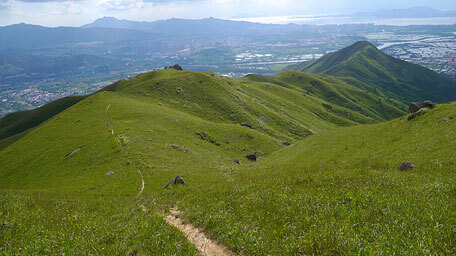 Note: During the downhill, there are some branch paths without any signpost, and some sections are full of loose gravel and overgrown with weeds. It is recommended to carry a map for reference. 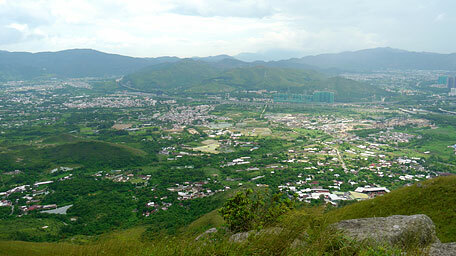 At the top of Kai Kung Leng, it is the best place to enjoy the sublime scenery over the western New Territory such as Yuen Long, Nam Seng Wai, Kam Tin and even Shenzhen of China.